Yes, I know it's supposed to be Treasure Chest Thursday, but I can't help it - I want to share some of the records that I (and others) have found in my/their repository and online searches for my ancestral families. 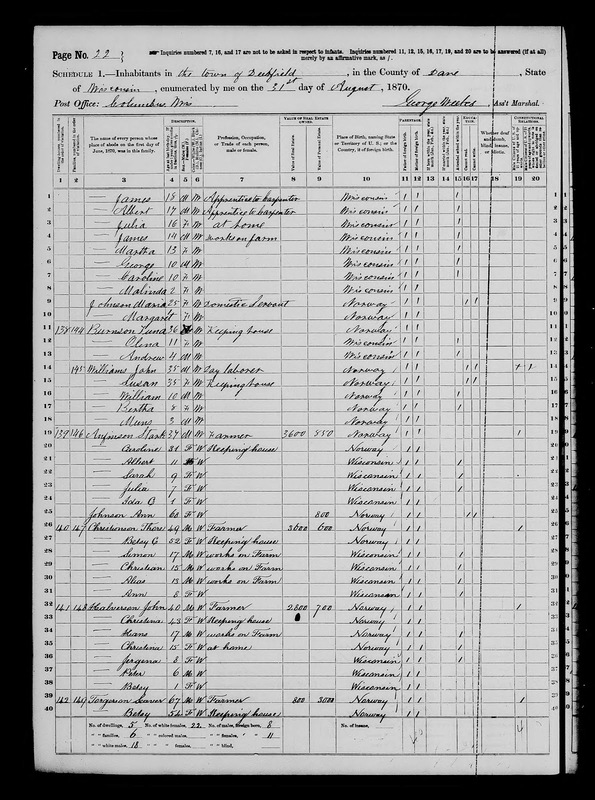 1870 United States Federal Census, Population Schedule, Dane County, Wisconsin, Deerfield Township, Page 179B, Dwelling #142, Family #149, Seaver Torgerson household; digital image, Ancestry.com (http://www.ancestry.com), citing National Archives Microfilm Publication M593, Roll 1708. This census record for the Seaver Torgerson household is spread over two pages of the census records. The parents have other children who are not enumerated in this record. Seaver Torgerson's Norwegian patronymic name was Sjur Torgersen, and Betsy Torgerson's Norwegian patronymic name was Brita Olsdtr. The Norwegian patronymic names of the children should by Sjursdtr. However, the family apparently followed the American custom of a common surname for all family members in the 1870 time frame. In the 1875 to 1880 time frame, the family members adopted the Leland surname. 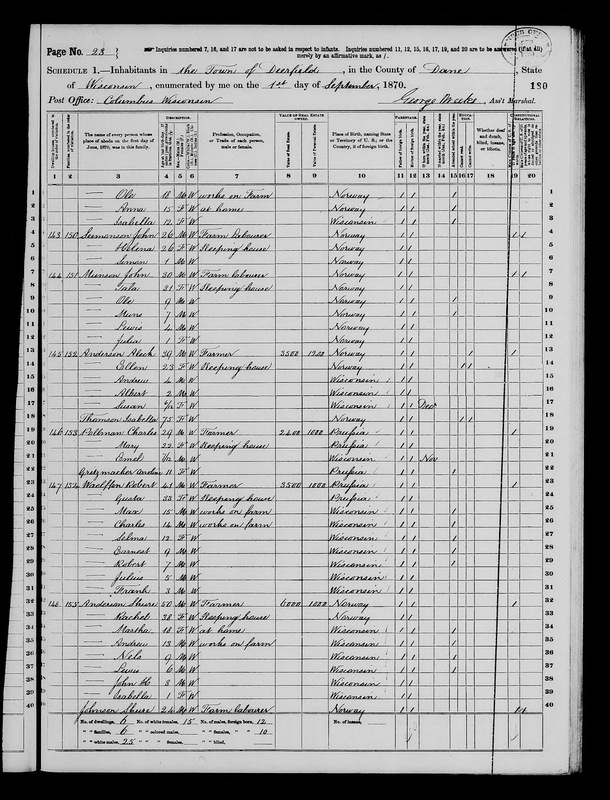 Sjur Torgersen (1804-1889) and Brita Olsdtr (1818-1895) are my wife's 2nd great-grandparents who migrated from Voss in Norway to Wisconsin in the 1850s, settling in Deerfield, Dane County, Wisconsin. Linda is descended from Torger Sjursen Leland (1850-1933), the oldest son of Sjur Torgersen and Brita Olsdtr, who married Anna Ellingsdtr Natvig (1853-1911). Am I Related to Hillary Rodham Clinton?